The March Point Heron Camera is finished running for the year. 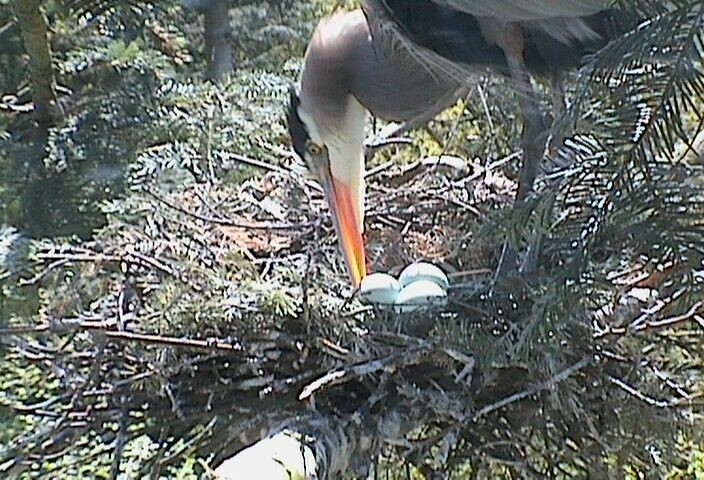 The Heron Cam is a solar-powered video camera that transmits live video of nesting herons at Skagit Land Trust's March Point Heronry property near Anacortes—one of the largest Great Blue Heron colonies in western North America. The camera is only active during the March - August nesting season and during the hours of 9am - 5pm. 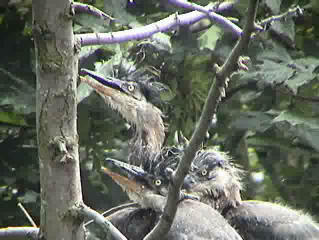 Click here to support Skagit Land Trust's work at the March Point Heronry and the heron camera. Please note herons in the donation line. Skagit Land Trust established the camera in 2006 in cooperation with Padilla Bay National Estuarine Research Preserve and in partnership with a Leadership Skagit "Heron Team." The Leadership Skagit team secured donations from several businesses, community groups and individuals, including major sponsor Landed Gentry. In 2014, after seven valuable years, upgrades to the system were funded by The D.V. and Ida J. McEachern Charitable Trust, Shell Puget Sound Refinery, and The Mountaineers Foundation. Thank you! Read the Skagit Valley Herald article. Vera and Bud Kinney donated this island of forest between Padilla and Fidalgo Bays to Skagit Land Trust in 1994 to protect the nesting herons. Learn more about the March Point Heronry on the property profile page. With the cooperation of neighboring landowners, Skagit Land Trust conducts a nest count in the heronry each year. In 2016, 546 heron nests were counted in this relatively small area, which provides easy access to feeding grounds for the herons. Unfortunately, Skagit Land Trust does not have access to all neighboring property, and therefore some heron nests are uncounted. The overall trend, however, shows increasing number of heron nests in the colony on SLT property and the property to which we have access -- and there are likely to be hundreds more nests on the adjacent property to which we do not have access. Skagit Land Trust, in partnership with volunteer citizen scientists, has begun to monitor portions of the heronry during nesting season, using monitoring protocol developed by Ann Eissinger, a regional wildlife biologist. In 2014, a group of Beachwatcher volunteers have also begun Forage Area Monitoring. Recent sound recordings also provide an insight into activity at the heronry during nesting season - listen in. Forinformation on the biology and natural history of this iconic species, click here to visit the Cornell Lab of Ornithology. Due to the sensitive nature of the heron nesting habitat, the March Point Conservation Area is closed to public access.